Yesterday, it happened again. For the second time in my life, I met a Black woman pilot. I had left the plane and was walking up the jet bridge when I saw her. I noticed the bars on her shoulders, so I walked up to the young lady and asked if she was a first officer. She confirmed that she was. 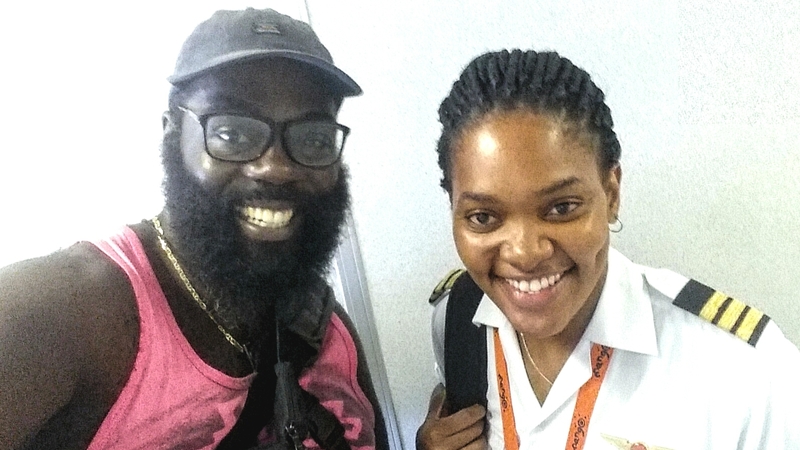 Nandi is a South African woman who currently flies as a first officer with Mango Airlines, based in South Africa. She stopped to chat with me for brief moment. I told her how excited I was to meet her, and the hope and promise that she gives me for the future. This is especially true now in my role as a teacher at my community’s high school. As a American man serving in the kingdom of Swaziland, I am increasingly aware of the privileges that I have through no merit of my own. One of the privileges benefiting me, as a man, is the fact that I get to see men in all kinds of positions throughout society. As a result, it’s rarely a question of whether I can attain a certain achievement. I have countless examples surrounding me as a man. As a Black man, I have fewer, but still numerous, examples around me. All of this brings me back to Nandi and my role as a teacher. I see teachers (myself included) as not only being responsible for teaching, but for inspiring their students. I want all of my students to truly believe that they can do anything. I believe that seeing examples who are relatable to our identities is important. A Black woman gave birth to me. Black women, from various sectors in society, have been instrumental in my life. I noticed some years ago that Black women weren’t just underrepresented in the cockpit. They were non-existent. In more than 20 years of flying, I had never encountered a Black woman pilot in real life. So, I made it a travel goal of mine to meet one Black woman pilot. This task grew more daunting as I spoke with my uncle who retired from Delta Airlines after more than twenty-five years of service. He informed me that he had only met one Black woman pilot in years of extensive work and leisure travel around the world. In September 2014, I met Gabrielle in San Francisco. Gabrielle is a first officer with United Airlines. Yesterday, I met Nandi in Johannesburg. During this month celebrating women’s history, I want to make sure that Black and brown girls around Swaziland, Africa, and the world know that there are amazing women like Gabrielle and Nandi shattering glass ceilings and blazing trails for you.